But here comes the problem, the easy this jobs the more difficult is to find one. Yes that’s true. There is not direct way or website available from where you get the assignment, you type it and submit it and you get paid. And the few such direct websites available has really low payouts that it is not worth at all to work for them even in free time. But I have researched a lot and listed out the top methods to by which you can get real, genuine and high paying Data entry jobs. First- Using micro jobs website. 1. keep the title and description of gig attractive and appealing. 2. Give a little extra- If the most rated seller is providing 10 pages per gig, you provide 20 per gig. You can reduce it once you start getting buyers and rating higher. 3. Fastest is first- Try to keep the days in which you will complete the work low, this attract the buyers and help you to get more orders. 4. If you can, spend some money on featuring your gig. As sometimes the buyer who wants to buy a gig same as you are providing is not able to reach your gig due to lack of visibility as there are lot of gigs. You have to provide quality service in low rates initially, once people start recognizing your work you can increase price eventually. HITs (Human intelligence tasks) as understood from the name itself are the tasks which only a Human can do. These tasks also involve Data entry and typing jobs. There are many websites which provide these services and people who work on these HITs are people on the internet. (Often referred as workers). Workings on these sites are easy. The sign up procedures are simple like any other email sign up, you have to provide your name, email address, and password etc. and you are ready to start. You can find a lot of HITs based on your qualification (Qualification here means nothing else but the good and positive rating you have from the people on whos HITs you work on) The most common jobs you can find is extracting information from image. For example the requester will take pictures of all the bills he get from all different stores and for any purpose he needs to create a systemize data of all the different items. So for that purpose he will upload all the pictures of the bills and ask the workers to extract the following information. You see the work is so simple but only a Human can do that. For every HITs you complete you get the amount specified. Yes Mturk is owned by Amazon. 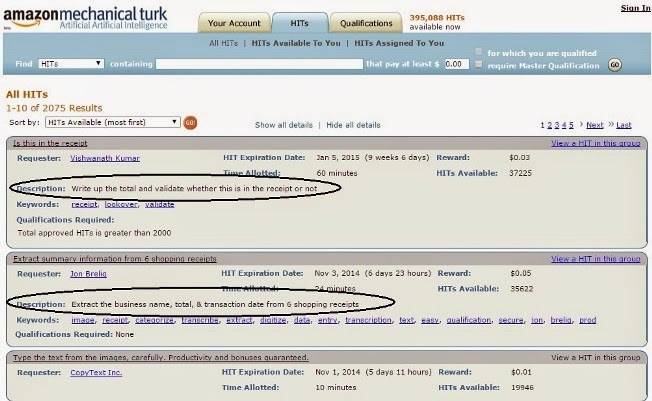 You know the standard of Amazon so there is no doubt about geniuinity of the Mturk. You can sign up for Mturk from HERE. Of course you can and I am sure you have solved them before also while signing up for different websites for example Gmail. These are call CAPTCHAs (an acronym for "Completely Automated Public Turing test to tell Computers and Humans Apart") as understood from the name these are filling activities which only an Human can do. Most commonly these involves interpreting text from an image and typing it in a text field. Some basic questions like – select the odd one out. Options- cat, dog, helicopter. Etc. Most legitimate site for the purpose. Easy sign up. Highest rates. There rates differ every hour so you can check the hour which have the highest rate from the statistics tab on megatypers.com. Minimum payout is low i.e. $3. And they pay their users on time. Note you need an mandatory invitation code at the time of sign up. 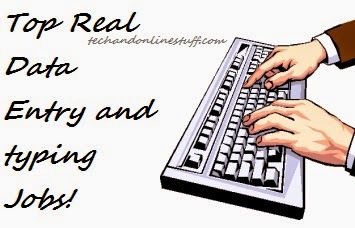 So these are the real, Genuine and Highest paying Data entry Jobs I have found after a lot of research and trials. If you know any other way for such jobs please share with us in the comment section below. If you have any questions you can leave them in comment section below.